V.com weekend vote: Do you play with 3-point or 2-point contact in the left hand, or a combo? 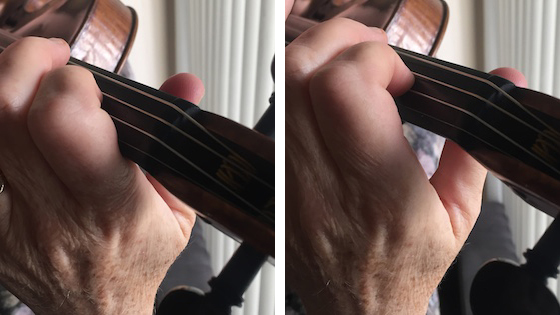 November 9, 2018, 1:29 PM · Here is a vote from reader Graham Emberton, who was thinking about how the left hand relates to the violin: How many points of contact with your violin or viola do you have in your left hand? At left, 3-point contact, side of index finger touches. At right, 2-point contact, side of index finger does not touch. Obviously the fingers will touch the strings, so that is the first point of contact. The thumb will provide a counter-balance, and that is the second point of contact. But how much is the side of your index finger in contact with the instrument? If you look at your left hand, there is a little line at the very bottom of your index finger, where it meets the rest of your hand. A bit under that line, you can feel a bone at the side of your hand - the base knuckle of that finger. Above is a little crook that can be used to help support the fiddle, or just to touch the side of the violin to give your fingers a reference point. How much we do or don't use that third point of contact, the side of the index finger, can really vary. Some fiddle players actually kind of "hold" the violin the left hand, so there is constant contact. For others this is more intermittent, touching the side of the hand when playing certain passages but then letting go for shifting, vibrato, etc. I have also seen players who seldom or possibly never touch with the side, and I've noticed some teachers actually teaching their students to play with no contact at all with the side of the hand (possibly to prevent "grabbing" the fiddle from the beginning). Personally, I tend toward that middle ground, a combination of using that third point of contact and letting go, touching intermittently with the side of my hand. How do you tend to play? Do you play with full 3-point contact (side of index finger pretty much always touching the neck), 2-point contact (no contact with the side of the index finger), or a combination? Please participate in the vote and then tell us your thoughts and perspectives on the matter. November 9, 2018 at 08:14 PM · As a teacher, I experimented once with teaching only two points of contact, thinking it might help make vibrato easier to learn in the long run. I quickly discovered the behind teaching three points of contact to start with and then gradually teaching them how to release the side of their index finger for vibrato. It's really hard for beginning students to develop a really beautiful hand frame without three points of contact in the beginning. November 9, 2018 at 09:36 PM · 2 point contact when I can. However, I play a 15.75" viola and have the shortest fingers of any adult I know. Playing on the G string (never mind the C) requires index finger contact, as I can barely get a millimeter or two or clearance with my elbow as far to the right as it will go. November 9, 2018 at 10:00 PM · In my opinion 3 contacts builds a "responsible" left hand and is a key to playing without a shoulder rest. November 9, 2018 at 10:51 PM · I am with the "depends" crowd. Specifically: If the base of the first finger touches the neck the finger will likely also touch the E-string. This will cause the open string to whistle if it is played. So I take distance whenever that might happen. November 9, 2018 at 11:48 PM · For me, the side of the index finger only touches the neck when I am not doing vibrato. Otherwise, I use 2-point contact. November 10, 2018 at 12:17 AM · Combination here. Definitely 2-point for shifting and vibrating. During 3-point, I aim for light contact only. November 10, 2018 at 06:58 AM · I never thought about it. I just do what works. Three point contact ceases to exist above the perfect fourth on each string. November 10, 2018 at 08:29 AM · 3 point contact because I don’t use a shoulder rest. I slide 2 points of contact - thumb and index finger - along the neck as I shift. In very humid weather I need talcum powder on these contact points. Fortunately that is rare. The violin is held lightly though, no grabbing. November 10, 2018 at 11:08 AM · I started learning to play the violin 5 years ago with a three point contact and I think that this gives a good reference position for intonation and support when shifting. However, since then, I have been learning vibrato - and the biggest difficulty I am having is learning how to move out of the three point contact into a two point contact. Any helpful tips always appreciated. November 10, 2018 at 12:50 PM · I think it depends. If you need to play a wide interval, for example 3 tones, in the same string, your wide opened hand will inevitably have 3 point contact. In other words, sometimes you can rotate your left wrist a little bit to make certain given notes easier to play. For example, jump from A in the G string to B in the E string. Your wrist naturally rotates a little to make that hand position easier, and you will probably use a 3 point contact. Is there actually a right option between 2 point or 3 point contact? Never read a discussion about it. November 10, 2018 at 03:57 PM · I just don't have enough dexterity in my left hand (no pun intended) to avoid contact with the base of my index finger against the neck. I was taught that contact is okay -- pressure is not. When I start to feel that pressure then I know I need to make a correction. November 10, 2018 at 04:44 PM · In my opinion, you should have 3 points of contact so that your brain/muscles learn more consistently where your let hand frame is,but after 4th position (+-) your index finger point of contact is replaced by your palm. So, in the poll I selected 3 points, but my index finger is not always the 3rd point of contact. And, if you play without shoulder rest, you probably need to use 3 points of contact..
November 10, 2018 at 06:03 PM · I think it depends to some extent on the individual's hand size and shape. November 10, 2018 at 11:47 PM · 3 point up until about 4th position with the thumb slowly moving underneath until it reaches the heel of the neck. The way I see it, is that the finger needs counter-pressure and 3 point reduces the amount of pressure against the thumb alone. With the addition of the chin (providing downward resistance) the counter pressure is divided by 3. For a beginner, the square of the finger against the nut can be a good way to find the note, the nut in itself being a tactile landmark (depending on the hands). November 11, 2018 at 01:00 AM · I try for limited ..when I think about it.Currently working on an etude that requires open string on top and left hand pizzacatto on bottom and realized that additional point of contact can get in the way. November 11, 2018 at 01:05 AM · Pamela Carr, I think that the wide vibrato on a swinging left hand that is facilitated by two point contact is quite overrated. Focus on a narrower vibrato. Henryk Szeryng taught that vibrato is a simulation of a trill without lifting the finger. November 11, 2018 at 01:32 AM · I find it highly uncomfortable to play with contact on the E string in 1. position-there is not enough room, if the wrist is not collapsed. November 11, 2018 at 07:27 AM · I look for freedom, so to be able to play combo, in my opinion, is better.. it gives you more flexibility for interpretation, like different vibratos or glissandos.. think about Menuhin's glissandos, they are impossible to be done with 3° contact point. November 11, 2018 at 10:57 AM · I like the idea that (as mentioned by Corwin Slack/Henryk Szeryng) that 'vibrato is a simulation of a trill without lifting the finger (off the string). This my way; but since the note is not flatted as in the accepted definition of vibrato is it a real vibrato. This is my method anyway and it sounds ok to me. And if the finger tip can be rotated by swinging the arm another dimension can be added. November 13, 2018 at 01:49 AM · I try to have two points. As my wrist is probably the worst ever at twisting, I generally end up with three. November 15, 2018 at 09:00 PM · I voted "sometimes touches" although "usually touches" would be more appropriate. I'm trying hard to minimize this, though. It took me six years to develop any decent sort of vibrato, when I finally realized that I was using that third point of contact to grip the neck. It gave stability, but also locked my hand in place, preventing it from vibrating. Even now, I have to make a conscious effort to get my index finger away from the neck to give my hand the freedom to vibrate.